Posted on Thu, Mar 22, 2012 : 5:57 a.m. The written word is the gateway to one’s imagination. This was the message local poet and Pioneer High School creative writing teacher Jeff Kass delivered to children at Ann Arbor’s Allen Elementary Wednesday. “With reading, you have to visualize everything in your head — what something smells like, sounds like, tastes like. (The written word) unlocks so many possibilities and creative juices,” he said. 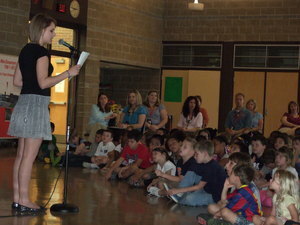 Pioneer High School senior Kristina Talarek recites a poem to Allen Elementary pupils Wednesday afternoon. Kass was Allen’s guest author for March is Reading Month. He also helped to transition the kids and fire them up for April, which is Poetry Month. Kass brought with him two Pioneer seniors — one a former Allen pupil — and his fifth-grade daughter to read poetry aloud to kids. He hoped to show students that poetry is a “current and vibrant art” and is not just something written a couple hundred years ago by a European guy and found in textbooks, he said. To illustrate his point, Kass recited from memory a poem he wrote about Dr. Seuss, showcasing a number of the unique words, rhymes and stories that Seuss was famous for, such as Sneetches and Whos down in Whoville, Yertle the Turtle and Thing 1 and Thing 2. 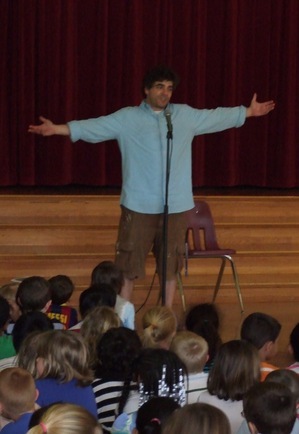 Jeff Kass, creative writing teacher and well-known local poet, entertains children at Allen Elementary Wednesday with his expressive antics and humorous poetry. But Kass stressed that not all poetry must rhyme or follow form. He said poetry also can be about anything — from a family vacation to swinging on a swing, from school to mermaids to wondering “what if?” or to ice cream saving the world, as his poems revealed. Laura Wolf, a third-grade teacher at Allen, said Kass did exactly what the staff had hoped he would: energize the kids about reading and poetry and show them how to manipulate words — both written and spoken. Kass’ animated vocal and facial expressions, as well as the child-friendly humor and content of his poems had the kids belly laughing frequently throughout his presentation. The children were mesmerized by Kass’ ability to recite his poems from memory at dizzying speeds. After the assembly, one student asked how long it took him to memorize his work. He said he has to read each poem 200 to 300 times before he can recite it without looking. In total, Kass probably has written 300 to 400 poems in the past 15 years, he said. For Poetry Month in April, he plans to write a new poem every day, so he hopefully will add another 30 poems to his total. He said this will be the third year he has participated in the “30-in-30” challenge. Students throughout Ann Arbor Public Schools are participating in March is Reading Month. Each school is doing something a little bit different. Logan Elementary tried to entice U.S. President Barack Obama to be its guest speaker at the school's Reading Month/Heritage Night finale March 30. Northside Elementary School Principal Monica Harrold has an annual tradition of reading to her students herself, visiting each classroom individually throughout March. Burns Park Elementary has a bedtime story night. Maybe if teachers licked ice cream cones while taking attendance, they would not measure the value of young hearts learning with multiple choice test scores. Maybe if world leaders traded scoops out of waffle cones, bullets and bombs would stop flying across borders. And maybe if Miss America, every once in a while, would eat ice cream, she would look like a real American woman. Maybe this poem can’t save the world, but maybe ice cream can. Fri, Mar 23, 2012 : 11:15 p.m.
Thu, Mar 22, 2012 : 2:20 p.m. He seems to be a great teacher, Pioneer is lucky to have him. I still remember his article about the kid who was starting to make strides thanks to Kass but had to leave Pioneer, possibly because of his district eligibility status, very unfortunate.